Y2K. The bug didn't bite. Well, if you were running MS-DOS (Pre Win9x, anyway) your date would reset to 1981, but you could manually reset it to the correct date, as I found out. 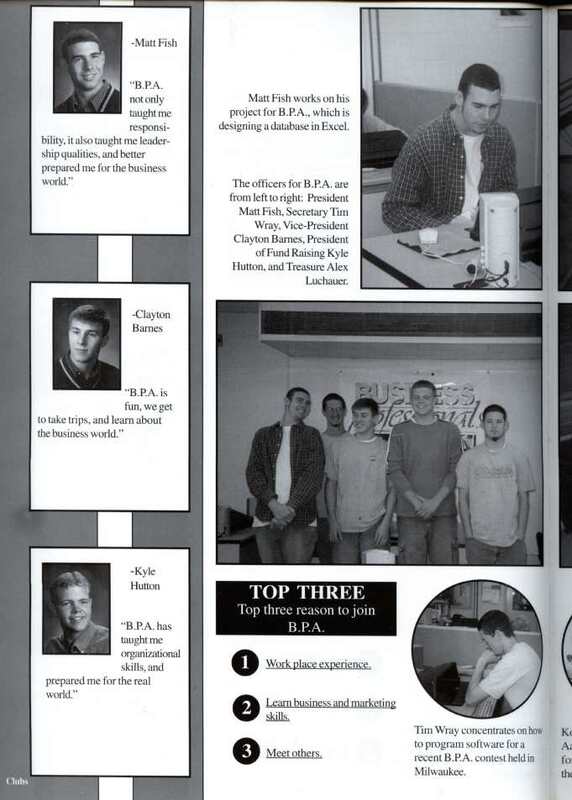 This yearbook page could very well be the most fabricated yearbook page in all of history. I remember a very frustrated yearbook person asking us all these questions, to which we had no answer. We posed for some pictures and told him to make up quotes for us, which he basically did. We just cleared them. The photo of me hard at work on the bottom right "concentrating on how to program software" is actually me deeply engrossed in a tough game of Team Fortress Quake against the other 4 guys (the pic of Matt Fish at the top is of the same, regardless of description.) Good times, good times. In 2000, I kind of stopped on the QuickBASIC programming. It was becoming quite apparent that MS-DOS was being completely phased out of the Microsoft Windows operating systems with the release of Windows Millenium Edition, and my beloved QB was 12 years old THEN. I had toyed with Visual Basic ever since version 2 was released, and it was similar enough that I managed to write a Windows version of my Inventory Organizer (see 1999 section). I tried to come up with some new ideas to write in VB, but WHAT to write kind of stumped me. I really didn't care for digging through my old QB code trying to create the same things in VB. It just didn't matter that much. TP2K was followed by "Backwood Realm Systems " for the first time. 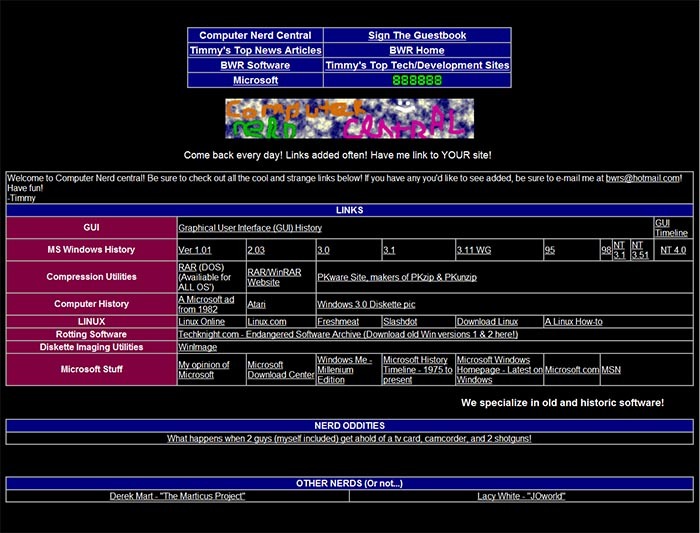 This is a links page (the only still existing in my archives) from the site, created in the summer of 2000. The file date of this html file is Aug. 27, 2000. It was from the first "Backwood Realm Systems" website. Color scheme look familiar? The links give an idea of what I was into at the time. Nerd stuff. Suprised? I had a thing for abandonware at the time, thus the "Rotting Software" section.